Only 500 people have been tested so far. Since hearing that elevated levels of lead were found in soil at Salazar Park in unincorporated East Los Angeles, Reina Rodriguez says she rarely takes her 4-year old son there to play. And while she only lives a few blocks away, the young mother says she never knew that she and her family were eligible for free blood tests for lead, paid for by Exide Technologies in Vernon and administered by Los Angeles County health officials. The blood-screening program, offered to east and southeast Los Angeles area residents who live near Exideâ€™s battery recycling plant in Vernon, was to end Jan. 31, but County officials said Wednesday they will extend the program until the end of February. Exide was found by state air pollution and toxic chemical regulators to have exposed as many as 110,000 people in the region to unhealthful, potentially cancerous and neurologically damaging levels of lead and arsenic. According to county health officials, since testing started in April 2014, only 500 of the estimated 30,000 people eligible have had their blood tested, despite 2,000 requests for the testing form. To date, none of the results have required medical intervention, according to public health officials, who are still analyzing the last tests administered. Those results will be mailed directly to residents. The administration and value of the testing has been questioned by a number of people concerned about the communityâ€™s exposure to toxic chemical emissions from the Exide plant. Some people have accused the County of not doing enough outreach to the public and of not making the testing more accessible. Boyle Heights resident Doelorez Mejia is one of those following the Exide issue closely, and she told EGP she does not trust the screening program. â€œWe all know lead is in our communities, itâ€™s in our soil,â€ adding that results from the blood test would only distract from the communityâ€™s efforts to prove Exide has caused health problems in residents. Exide agreed to pay for the confidential screenings administered by the County as part of their effort to remediate the fallout from the state regulatorsâ€™ findings and backlash from community activists and elected officials, many who want the plant shut down permanently. Many residents EGP spoke with said they do not believe blood testing is the appropriate way to determine chronic exposure to toxic chemicals such as lead. According to Joseph R. Landolph Jr., Associate Professor of Molecular Microbiology, Immunology, and Pathology at USCâ€™s Keck School of Medicine, lead only stays in the blood for 30 days before it breaks down. Although blood testing is the standard form of determining exposure the lead, it actually stays in a personâ€™s bones for up to 20 years, Landolph said. In adults, 90 percent of lead is found in bones, he told EGP.Â Because it stays in the bones, pregnant women and those undergoing menopause are prone to reabsorbing the lead, he explained. â€œAll the [test] would say is that lead is in your blood,â€ Landolph said. Once lead is found, the county would have to determine exposure by looking at the individuals surrounding and â€œassume everything is a contribution in proportion to how much they put out,â€ he added. That is why Teresa Marquez of Boyle Heights did not get tested. She told EGP the test was â€œnot worth the trouble,â€ especially since any alleged exposure from Exide may be gone since the plant was closed in March 2014 to make facility improvements. Marquez believes the County and Exide do not want to spend the higher cost of arsenic testing, which would ultimately do a better job of show what damage has been done. However, Landolph, who is a member of the USC/Norris Comprehensive Cancer Center and an expert in arsenic, told EGP arsenic only lives in the blood for 10 hours. He did say, however, that concentrations from chronic exposure could be found in fingernails and hair. One indication, he said, could be white bands on fingernails. Exide had not responded to EGPâ€™s request for comment as of press time. County officials told EGP there are no plans to conduct arsenic testing. They add that such testing would only be appropriate for acute arsenic poisoning not chronic, long-term exposure. They focused on lead because only elevated levels of lead, not arsenic, were found in the area. For most residents, the value of the tests is not what kept them from seeking the screenings. Instead, they simply did not know about the free blood testing program. Lifelong East Los Angeles resident Alice Gallardo, 80, said the testing information was not readily available to the community. â€œNobody came to us,â€ she said. She added that the process would have been easier if the county went to local senior centers and parks to inform the public. Public health officials are defending their outreach. In an email, a spokesman for the department of public healthâ€™s environmental health division told EGP the County mailed out flyers with instructions on how to get tested to the 30,000 area residents in the impacted area in April 2014 and again a couple months ago. They also held town halls in Commerce and Maywood in April 2014, and gave progress updates at a couple community meetings held at Resurrection Church. County officials told EGP public health nurses conducted door-to-door campaigns in the neighborhoods surrounding Exide and conducted outreach with area schools. Lucia Sandoval was at Salazar Park earlier this week with her grandson. 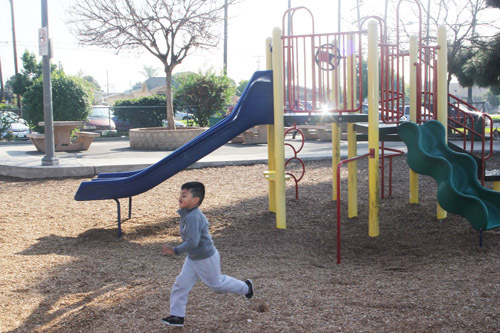 The park is located a mile from the Exide plant in Vernon. Speaking in Spanish, she told EGP, â€œIf I didnâ€™t know about it and didnâ€™t get testedâ€ how would he get tested, she said referring to her grandson. State regulators ordered Exide to pay for the removal of contaminated soil at Salazar Park and to establish a $ 9 million fund for the clean up of other contaminated sites. Marquez insists the testing program could have been better handled. If the county really wanted to inform the public, they would have held a health fair and offered testing on a weekend to make it easier for the blue-collar community, she said. In the absence of any significant outreach, extending the testing deadline may not do much to raise the number of people tested, however.